Managing disorder: towards a global state of control? Refusing to tackle the causes of our troubles and allow public space for dissent, the neoliberal state is sliding inexorably towards authoritarianism. 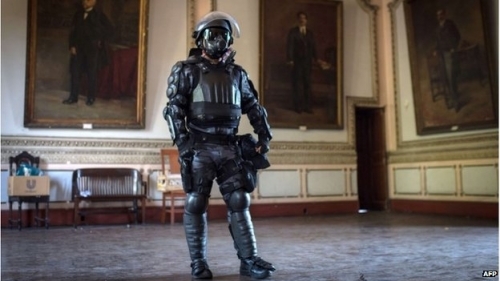 Image: Brazilian police demonstrated its new riot gear last month. When an Egyptian judge condemned 529 Muslim Brotherhood supporters to death this week, he underlined in one fell swoop the terrifying reality in which the world finds itself today. The revolutionary euphoria and constituent impulse that shook the global order back in 2011 have long since given way to a re-established state of control. Violent repression of protest and dissent — whether progressive or reactionary — has become the new normal. The radical emancipatory and democratic space that was briefly opened up by recent uprisings is now being slammed shut. What remains are dispersed pockets of resistance under relentless assault by the constituted power. While the mass death sentence of Islamist protesters in Egypt is an exceptionally violent and lethal instance of this process, the army’s counter-revolutionary consolidation appears to be indicative of a more generalized trend that can be felt across the globe. In Turkey, Prime Minister Erdoğan — who back in 2011 criticized Mubarak for his hard-handed repression of the popular uprising — just blocked access to Twitter and YouTube. When a 15-year-old boy, Berkin Elvan, died after spending 9 months in a coma, having been shot in the head by police while getting some bread during the Gezi protests, Erdoğan justified the killing by branding the kid a “terrorist”. In Spain, meanwhile, the right-wing government of Mariano Rajoy is reverting to old-fashioned Francoist tactics to suppress the country’s powerful anti-austerity movement. Riot police once again violently cracked down on a massive demonstration in Madrid last weekend, while authorities are eagerly drawing on the new “Citizens’ Security Law” to prosecute the arrestees, some of whom now face up to 5 years in prison. Spanish Parliament voted last year to outlaw demonstrations in front of government buildings and to criminalize the act of calling for such protests on social media. Those who get caught face hefty fines of up to 600,000 euros and serious jail time. It’s not just right-wing or military regimes that are leading the assault on hard-fought popular freedoms. In Brazil, the ruling Workers’ Party announced this week that it would send the army into Rio’s favelas to pacify the slums ahead of the World Cup. Ostensibly targeted at violent drug gangs, this pacification scheme has led to a situation in which hundreds of slum dwellers are killed by state troops every year. Under President Rousseff — a former Marxist guerrilla who was tortured and imprisoned by the military dictatorship — state brutality against the “unruly” poor and excluded remains the order of the day. Just last week, Brazilian military police were caught on camera after shooting and killing a 38-year-old mother of four and dragging her lifeless body 200 meters down the street in their police van. The state in which we live now is no more a disciplinary state. Gilles Deleuze suggested to call it the État de contrôle, or control state, because what it wants is not to order and to impose discipline but rather to manage and to control. Deleuze’s definition is correct, because management and control do not necessarily coincide with order and discipline. No one put it so clearly as the Italian police officer, who, after the Genoa riots in July 2001 declared that the government did not want for the police to maintain order but for it to manage disorder. Governing the effects, or managing disorder, has thus become the defining paradigm of neoliberal government. Perhaps none of the events of the past week illustrated this more clearly than the Nuclear Security Summit held at The Hague. As 53 heads of state and government were flown into the Netherlands to conclude a number of agreements on securing stockpiles of nuclear material and preventing them from falling into the hands of terrorists (as if copious amounts of plutonium in the hands of the military and corporations were somehow not a threat to our safety), the city of The Hague and large parts of Holland were effectively submitted to an undeclared state of exception. In a historically unprecedented security operation, the Dutch state mustered some 13.000 police officers and 8.000 military troops. Mobile anti-aircraft batteries were deployed along the coastline, battleships cordoned off sea access routes, and F-16 fighter jets and AWACS surveillance planes patrolled the skies overhead for 24 hours a day to secure Dutch airspace. One major highway was entirely blocked off, sewer manhole covers were welded shut, and large parts of town were declared no-go zones. When President Obama passed by Amsterdam to have a look at some paintings, he arrived in an aerial cavalcade of nine military helicopters full of heavily armed counter-assault teams. Authorities warned neighbors not to go onto their balconies or rooftops during Obama’s visit, presumably because the place was crawling with snipers. A naive citizen may be led to wonder: if world leaders were really just simple human beings like the rest of us, humbly living up to their responsibility towards the community by fulfilling their democratic mandate in the name of the sovereign people, surely such an absurd security operation would never even have been necessary in the first place? If the causes of our present discontent had been properly looked after, surely politicians wouldn’t need to be so paranoid about coming into contact with “the people”? And if these heads of state truly cared about nuclear security and the well-being of their citizens, surely they would have addressed the root causes behind nuclear proliferation, like the very production of weapons-grade plutonium to begin with? Of course, none of this was the case: once again, world leaders found themselves governing the effects, managing disorder, and spectacularly re-imposing their state of control. If the mass death sentences in Egypt, the social media crackdown in Turkey, the anti-protest laws in Spain, the favela pacification scheme in Brazil, the NSA surveillance program in the US, and the undeclared state of exception around the Nuclear Security Summit in the Netherlands have anything in common, it’s that they all point in the direction of an inexorable slide into a new form of authoritarianism — an ostensibly “democratic” authoritarianism that hides behind a facade of free markets, fair elections and respect for the rule of law to secure the increasing concentration of wealth and power by shrinking the public space for democratic participation and popular dissent. The only question that remains is: how much longer can this illusion of control be maintained? How much longer can the neoliberal state systematically ignore the root causes of its own self-destructive delegitimation? When, in other words, will the resultant disorder cease to be manageable? And, perhaps most importantly, what can be done to accelerate the eventual arrival of that moment? Posted on March 30, 2014, in Uncategorized and tagged Egypt, Spain, Turkey. Bookmark the permalink. Leave a comment.